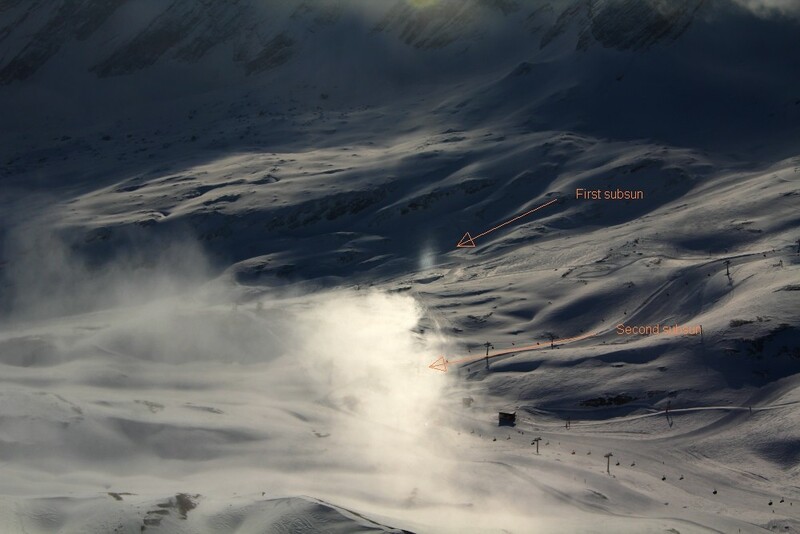 During a sunrise on 2013, May 13th I saw from the Zugspitze (2963m) two pillars with different inclinations. The most remote pillar was diffuse and came from virga below altocumulus; the other one originated from nearby icefog and was narrow and distinct. Unfortunately in most of my photos the two pillars overlap, but at the end they show up separate. The 3-D impression was very fascinating. Subsuns appear very often during wintertime. It may happen that they appear in two different ice clouds: one of them may be affected by sheer wind causing the crystals to be tilted. Then, two subsuns are visible, one of them being displaced from the solar vertical. 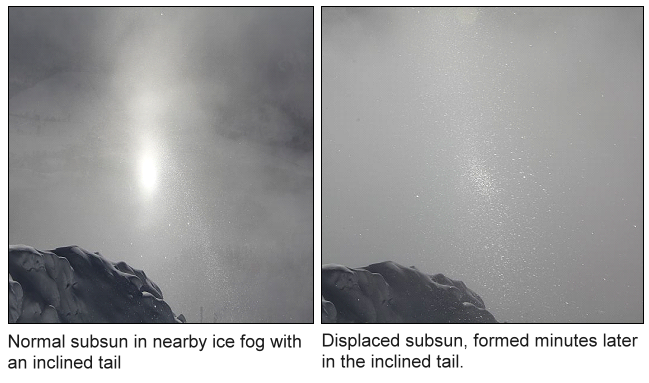 A displaced subsun is often a indicator for imminent sheer winds at the observer’s spot. Double Subsuns on Mt. Wendelstein (above) and Mt. Zugspitze. This entry was posted in unusual halos and tagged double halos, subsun, sun pillar. Bookmark the permalink.